Do you have your Thanksgiving meal ideas yet? You may want to add this Sweet Potato Casserole to the list. While it still tastes indulgent, it is made a little healthier. I am very pleased with the way it came out. I am a lover of all things sweet potato if you haven’t guessed by now! If you love sweet potatoes as well, you will love my sweet potato chili and my sweet potato cookies. I know pepitas are not normally an ingredient in the traditional casserole, but I added them for an extra boost of protein. They also add great color to the dish. This sweet potato casserole is vegan, gluten free and even paleo friendly. It also has no oil! The perfect Thanksgiving side dish! In a large stock pot , add the potatoes and water. Boil until soft. Transfer the potatoes to a mixing bowl. Add the coconut cream, vanilla and salt and whip until smooth. 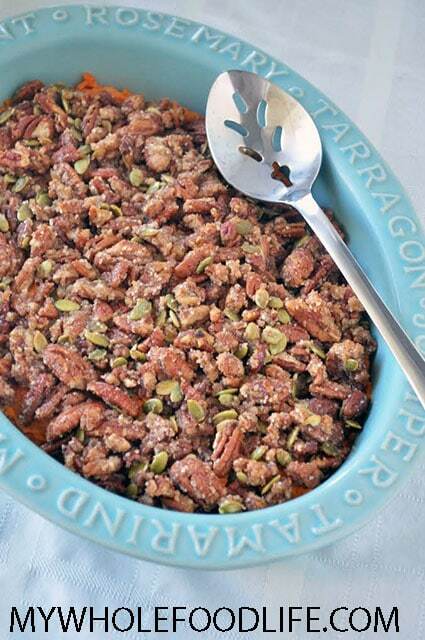 Spoon mixture into a casserole dish and bake for 25 minutes. While the potatoes are cooking, mix all the topping ingredients in a bowl . Spread the topping over the potatoes and cook for another 15 minutes. This should last at least 4 days in the fridge. The topping might soften after being stored in the fridge. To crisp it back up, just pop it in the oven for 10 minutes. Enjoy! This looks so good and is exactly what I'm looking for!! But did you mean really 2 potatoes? Or maybe more like 2 lbs.? Doesn't seem like 2 individual potatoes would cut it. They were 2 very large sweet potatoes. I tried something totally different with sweet potatoes not too long ago - a savory sweet potato salad with onions, bell peppers and jalapeños (among other things). It was amazingly good to see these on the dark side, and even made pan fried with coconut oil, curry and salt! Who knew they could be amazing without sugar, syrup or marshmallows! What could I sub for the coconut cream? You can make coconut cream from coconut milk. Just refrigerate the canned coconut milk, scrape off the fatty part, and whip into a cream. Is there anybody who isn't a lover of all things sweet potato? Just asking.... And I LOVE the addition of the pepitas. They go SO WELL with sweet potatoes.